Media and Contents: Soft cover, 80 pages plus Mosquito color camouflage guide. Advantages: Superb standard of modelling; good selection of modelling projects, subjects and colours; great creativity and innovation applied to projects; breathtaking composite images; high quality photography including plenty of construction photos; useful and descriptive text. De Havilland's "wooden wonder", the DH.98 Mosquito, was the scourge of German night fighters and bombers; and the protagonist in many of the most daring and famous aerial raids of the Second World War. With great kits available in 1/48 and 1/72 scales and interesting differences between variants, not to mention some good looking and varied finishes, the Mosquito is certainly a logical choice as a subject in the Osprey Modelling series. Master modeller Roy Sutherland has put together an impressive package for this newest title in the Osprey Modelling series. The book commences with a Foreword from Mosquito pilot, Group Captain J.R. Goodman DFC AAFC, followed by some historical background and a summary of Mosquito variants, kits, accessories and decals by Chris Bucholz. The focus of the introduction, along with the rest of the book, is 1/72 and 1/48 scales. As the benchmark Mosquito kits in any scale, it is not surprising that the modelling side of the book deals exclusively with the Tamiya's Mosquito family. Roy outlines the attributes of the kits, and also makes a suggestion for correcting the height of the fin with the assistance of an illustration by Jennings Heilig.. The standard of modelling and finishing in all of the projects is truly outstanding. My favourite is Roy's 1/48 scale Mk.XIX. The attention to detail and especially the battle-damaged bare wooden finish has to be seen to be appreciated. This project points to the "X" factor in modelling that goes beyond the quality of the model or the technical skill of the modeller - creativity and imagination. The model builds are very well documented in photos and text, with helpful captions adding even more value. Roy demonstrates scratchbuilding, detailing, painting and weathering tehniques that will be useful not only on Mosquitos, but for any aircraft model. The selection, composition and reproduction of the photos is excellent. In particular, the composite images of completed models against real backgrounds - especially the in flight shots - are convincing and attractive. A Gallery follows, with Scott Bregi's 1/72 scale Mosquito prototype, Paul Rodgers' 1/72 scale NF Mk.II, Mark Robson's Aussie FB Mk.VI, Chris Wauchop's 1/48 scale FB Mk.VI and more. The book is rounded out with a list of Museum examples and references, and a page of colours typically worn by the Mosquito family. Roy Sutherland's "Modelling the De Havilland Mosquito" is an inspiring and impressive guide to building Tamiya's "wooden wonder" in 1/72 and 1/48 scale. The models are outstanding and their construction and finish is very well documented. Photography is excellent. 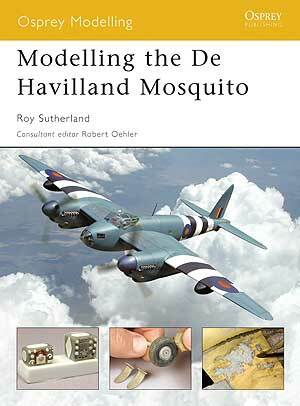 This book will be an essential companion to modellers building or converting any of Tamiya's Mosquito family of kits.